Osman A Dar is a fellow of the Royal College of Physicians (Edinburgh) and a fellow of the Faculty of Public Health at the Royal College of Physicians (London). At Chatham House, he is director of the Centre on Global Health Security's One Health project, an umbrella term referring to the Centre's work on zoonotic emerging infections, ecological approaches to disease control, antimicrobial resistance, sustainable livestock development and food security. In addition, Osman leads work on health system strengthening by creating partnerships between the public and private sectors to improve the prevention of, preparedness for, and response to public health emergencies. 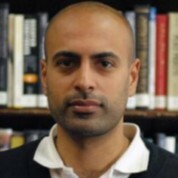 Osman is also a consultant in global public health at Public Health England (PHE) where he is a technical lead on a programme that supports low income countries build core capacities and implement their commitments under the international health regulations through the development of strengthened national public health institutes.